What a wacky, irreverent, dirty and ultimately wonderful musical “The Book of Mormon” is. Created by Trey Parker and Matt Stone of “South Park” and Robert Lopez of “Avenue Q,” it continues through Feb. 7 at Broward Center for the Arts. This is the third production of “Book of Mormon” I’ve seen. I feel it is the best. The singing, dancing and joke delivery are near perfect. The script has been revised and tweaked in each subsequent touring company. There is a new visual comedy bit at the very end that makes for a perfect finale. I won’t give it away except to say it involves Arnold Cunningham (Chad Burris), the shyer, less handsome “elder” who discovers he is a lot more charismatic than he ever knew. “Book of Mormon” is a satirical comedy aimed mostly at the peculiarities of the Church of Jesus Christ of the Ladder-Day Saints. Original church prophet Angel Moroni (Daxon Bloomquist) is an easy target. Supposedly back in 362 A.D. God spoke to him directly and he engraved God’s instructions on golden plates. The plates were buried in Upstate New York for safe-keeping. There they remained until 1823, when they were discovered by Joseph Smith. Smith allegedly translated the information into a book that became the Book of Mormon. The church was formally opened in 1830 in New York. Smith was murdered by an angry mob in 1844 and church leadership was taken over by Brigham Young from 1844 until his death in 1877. All these characters are played for laughs, including Jesus Christ. One of the oddest claims of the church is that Jesus appeared to Moroni in the USA after his resurrection. Ryan Price is requisitely handsome and charming as the outgoing Elder Kevin Price. How can a 19-year-old boy be an “elder?” Never mind. Chubby Chad Burris is the scene-stealer as Elder Arnold Cunningham, a guy who “makes things up,” but finds a way to communicate with the Ugandans, where Price and Cunningham had been dispatched as missionaries. Among the natives Arnold charms is Nabulungi (Candace Quarrels), daughter of the local Chief. The most colorful character is a brutal, Idi Amin-style General we shall just call BFN, powerfully played by David Aaron Damane. There is a big production number on the African song “Hasa Diga Eebowai” with a big punchline when the meaning is revealed. 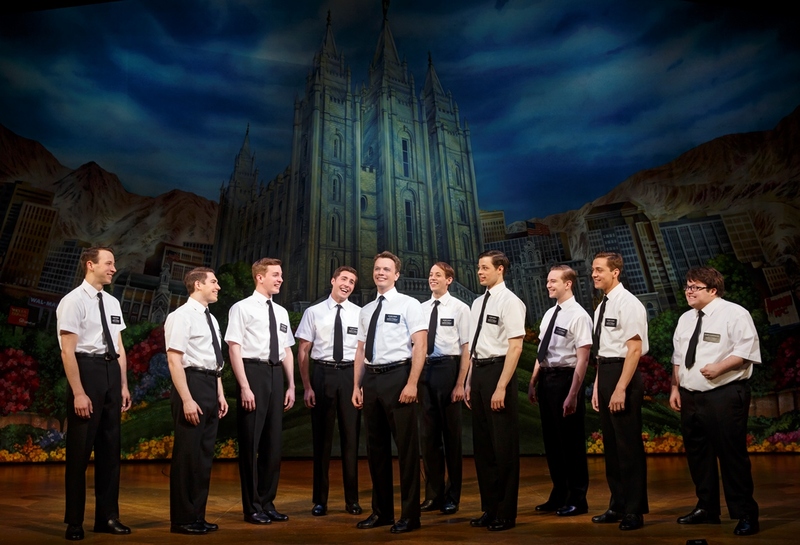 “Book of Mormon” is the kind of show you can discover new things on every viewing. It is no accident it won a whopping nine Tony Awards, including Best Musical. If you don’t mind some foul language or pointed satire at rigid religious ideas, you should enjoy it as much as I. Tickets are $40-$150 at TicketMaster or the box office Call 954-462-0222 or go to www.browardcenter.org.